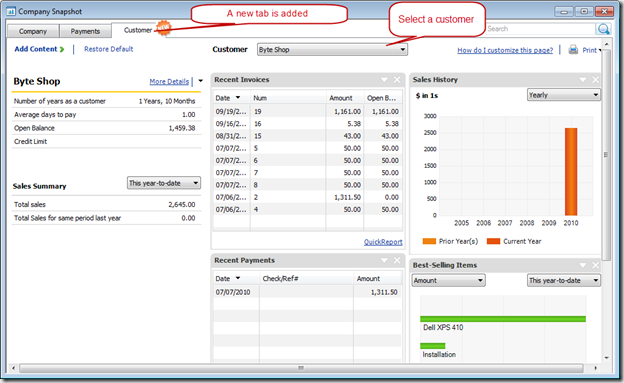 Expanding on the Company Snapshot feature, QuickBooks 2011 adds a Customer Snapshot that provides several useful summary views of information on specific customers. 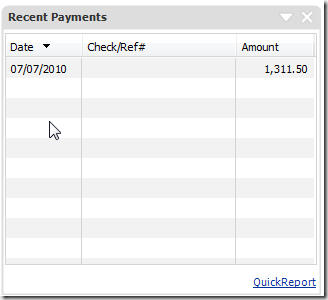 The Company Snapshot feature was introduced in QuickBooks 2009 (and enhanced in QuickBooks 2010). I’ve found it to be a very useful tool in providing a quick visual analysis of important information in my company file. 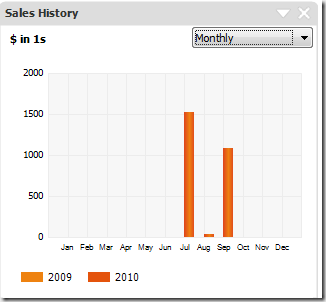 With QuickBooks 2011 we now have the Customer Snapshot to provide us similar graphical analysis of specific customers. Unlike the Company and Payments snapshot tabs, the Customer snapshot is specific to one customer, which you select from a dropdown list. Alternatively, you can select Customer Snapshot from the Customer Center. I’ve become more and more dependent on the Snapshot feature to provide me with a quick and graphical view of how my business is performing. I like not having to spend a lot of time looking at various reports scattered throughout the program. Having one place that lets me take a quick look has been very useful. Adding the Customer Snapshot is a move in the right direction, but I am hoping that they can add more analysis/comparative information. Listing of current activity is simple to do in the Customer Center already, with more flexibility than we have in the Snapshot. I would like more graphic analysis that compares the prior year to the current. This section provides you with a quick summary of some important metrics for the selected customer. 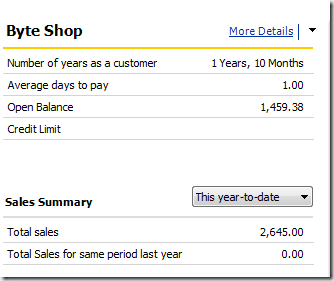 Note the Number of years as a customer item – this can be a useful piece of information. Clicking on More Details takes you to the Customer Center. 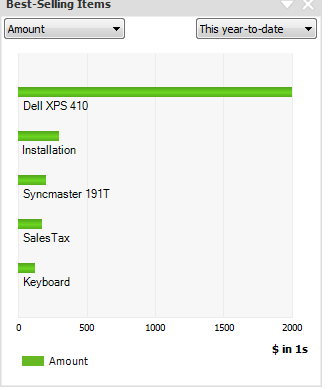 This will show you a summary of recent invoices. You can’t change which columns show or change the date range shown, but you can open the invoice by double clicking on it. Clicking on the QuickReport link will open a customer report showing a summary of the invoices. A summary of recent payments. 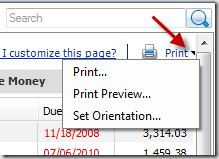 Same as above – few options to modify, double click to open the transaction, and a link to a QuickReport showing just payments. 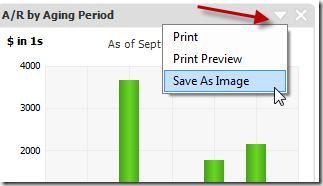 You have options to show yearly, quarterly, monthly or weekly statistics, and the graph will include the current and prior year. I found this more useful than some of the others, but I would like to have the ability to compare with prior years. 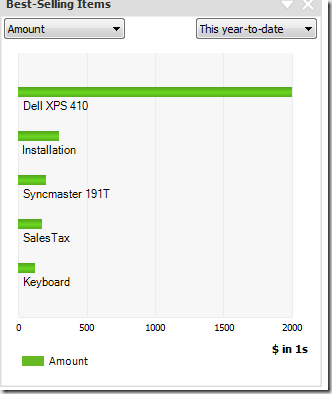 You can select amount or quantity, and the time range to show. In addition to the new Customer tab, there are a few other smaller improvements. 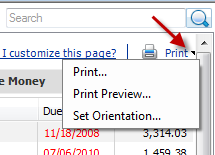 The Print link for the overall snapshot page add the option to set the page orientation of the printouts. 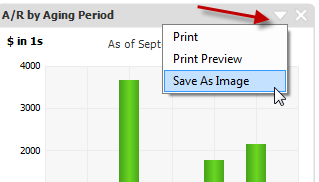 Individual widgets have an additional option to save the graph as an image. 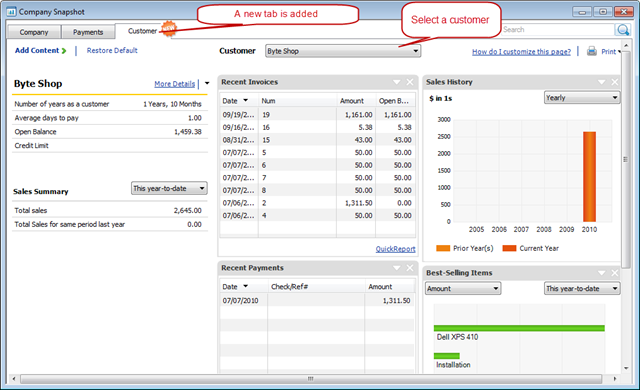 Charlie – another excellent ‘blog’ on the new user friendly features of QuickBooks 2011. We all appreciate your insight! 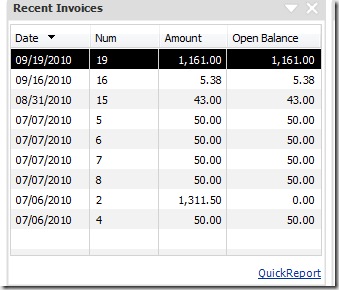 Charlie as an end user of Quickbooks – do the accounting for a firm. When is the best time to upgrade? Do you wait for a while – do it before year end, after year end? Faye, lots of factors there. I recommend waiting for a month or so after the initial release of a new year of QuickBooks, so that we can see if there are any big issues that cause problems. I definately do not recommend making a big change in your procedures (including upgrading software) right before a busy time of the year. So if your year end is busy, if you have a lot of postings to enter, if you are doing a year end physical inventory, or the year end is a hectic time for the kind of business you are in, you might put that off until things are settled down. Don’t change your software at a time when you cannot afford to take the time to do the change right. Charlie: Thanks for another great article on 2011 Features. My question is; Can you select a Job under a Customer and see this information just for the Job as you can now in the Customer Center? Will, you can only select the customer, not a job within the customer. At least at this time. That would be a great suggestion to pass on to Intuit. I can’t think of a reason to not have that option, off the top of my head. Hi Charlie, I installed 2011 and did all my updates but I don’t have the company snapshot information. I have premiere, manufacturing. Any suggestions? Robin, based on your email address, I’m assuming you are using the Canadian version? My articles here focus on the US version, and there are numerous differences. However, in the 2011 Canadian version, I do see that there is a “Company” snapshot option under the “Company” menu. But it doesn’t have the “customer” option that we have in the US version. The Canadian versions tend to lag behind the US versions in these kinds of new features (and sometimes they don’t appear at all). 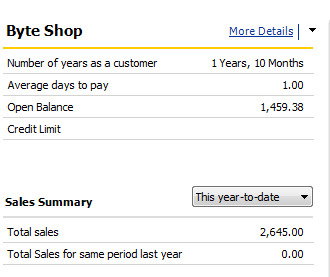 I am looking for a way to utilize the “Number of years as a customer” field in sales reporting, looking for customer trends. I have been unable to find a way to extract this data as part of the customer list. Ultimately I would like to be able to include this data as part of the Sales by customer report. Do you have any suggestions? We are using Manufacturing and Wholesale 11.0. Jon, I don’t believe that you’ll see that in any report in QuickBooks itself, directly. That is a calculated field. If you use the QODBC driver you would find the “TimeCreated” field, which would give you the date that the customer record was created.